Muppet Yoda wasn't George Lucas' first choice to bring the character to life. 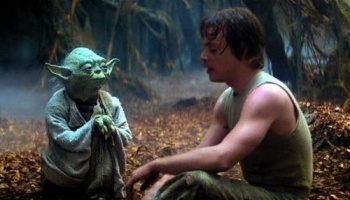 The first Yoda liked bananas and picking fleas off you with the force. Making sci-fi movies in the early eighties was a tricky business. While you could put whatever you liked in the script, actually getting that giant lizard or space station up on the screen was a different matter. But when it comes to Star Wars, one of the most problematic things was actually one of the smallest. In a new book chronicling the creation of Empire Strikes Back, J.W. Rinzler said that Yoda, the diminutive Jedi master, left the special effects team scratching its head, as animatronics wasn't thought to be advanced enough to pull it off convincingly. Instead, the crew tried putting a trained monkey in a Yoda costume, including a mask. They soon abandoned the idea, however, when someone with prior experience working with primates on 2001: A Space Odyssey pointed out that the monkey would keep pulling the mask off. It was at that point that Lucas turned to Jim Henson, and the puppet Yoda that we know and love was born. Also revealed in Rinzler's book is that the Wampa attack on Hoth station was cut because the costume for the Yeti-like beast looked fake and no one could take more than a few steps in it withput falling over. The Wampas were supposed to be the reason that Han Solo's Millennium Falcon was so unreliable in the movie, but with the scene cut, the Falcon just became an old and occasionally unreliable ship. With modern computers making incredibly sophisticated animations and puppetry possible, the days of monkeys in suits are just a memory. All the same, it's super interesting to see all the creative ways that filmmakers achieved the effects they were looking for before CGI could fill in the blanks.